62yF with h/o low back pain presents to ED decreased sensation to bilateral upper extremities, R>L. Family reports weight loss and increased muscle cramps for over 1 month. Stroke team activated, GCS 15, NIHSS score 1 (decreased sensation over hands). 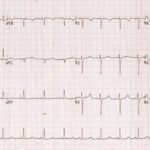 NCHCT is negative for ICH. 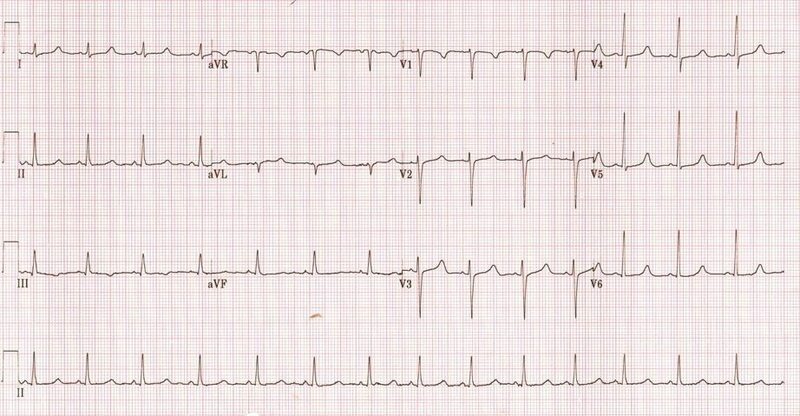 EKG as shown. What additional physical exam maneuvers can help you at this time? Note the prolonged QTc and hypocalcaemia on POC lytes. Signs of latent tetany such as Trousseaus sign (carpal spams by inflating BP cuff and maintaining pressure above systolic) or Chvostek’s sign (tapping along CNVII to produce facial spasms). What’s your differential at this stage? What additional labs, testing, or imaging are needed at this time? Note the markedly elevated WBC count with elevated blast, likely placing this patient at risk for clinical manifestations of blast crisis. In addition, note the combination of hyperkalemia, hyperphosphatemia, and hypocalcaemia making the presentation likely to be due to Tumor Lysis Syndrome (TLS).TLS is an oncologic emergency. It is due to release of intracellular contents from lysis of cancer cells. Tumor cells release large amounts of potassium, phosphate, and nucleic acids leads. Nucleic acids are catabolized in uric acid, leading to hyperuricemia. Classically, patient’s symptoms occur 72 hours after initiation of cytotoxic therapy or steroid. It can also occur in patients with solid tumors and spontaneously in cancers with large tumor burden and high proliferative rates, like in this case. TLS is characterized by metabolic derangements, clinical manifestations of met derangement, and renal failure. Symptoms range from nausea, vomiting, diarrhea, anorexia, lethargy, heart failure, cardiac dysrhythmias, seizures, muscle cramps, tetany, syncope and possible sudden death. Treatment consists of IV hydration and addressing TLS associated metabolic derangements.Hyperkalemia: if evidence of EKG changes, start with calcium gluconate to stabilize membrane. Use of beta agonist and dextrose with insulin to drive potassium intracellular. Kayexalate can help with elimination of potassium in stool. If persistent hyperkalemia hemodialysis. Hyperuricemia: Due to catabolism of nucleic acid to hypoxanthine and xanthine, which are then converted to uric acid via xanthine oxidase. Uric acid is not very soluble, especially so in the usually acidic environment of the distal tubules. Overproduction and the associated over excretion can lead to stone precipitation, leading to AKI. Treatment options include allopurinol or Rasburicase. Allopurinol works as competitive inhibitor of xanthine oxidase. Rasburicase catalyzes the oxidation of uric acid (poor water solubility) to allantoin (high water solubility). G6P deficiency is a contraindication for the use of Rasburicase. There is no evidence supporting urine alkalinization. Hyperphosphatemia and hypocalcaemia: Hypocalcaemia is due precipitation of calcium phosphate due to rapid increase in phosphates. Tumor cells can have up to four times the normal levels of phosphates. Clinical manifestations include muscle cramps, tetany, arrhythmias, seizures, renal failure from nephrocalcinosis and death. Treatment with non calcium phosphate binder or HD. Unless there are EKG changes avoid calcium repletion as it can lead to further precipitation of calcium phosphate.